RushEssay.com’s website offers a user friendly navigation page with all the tabs front and center for customers to click on, including pricing policies, ordering policies, available services, FAQ, and terms and conditions. Everything on the website is well written and easy to understand. Along the right side of the homepage is the login information for existing customers as well as the order form. RushEssay.com has three distinct levels of pricing – standard, advanced, and premium. Regular pricing is $22.95 per page, $24.95 per page, and $26.95 per page respectively. However, if a customer needs their paper within three hours, which is the minimum amount of time a customer can request, the price shoots to $48.95 per page, $50.95 per page, and $54.95 per page respectively. RushEssay.com does not offer any kind of clear discount policy for new and/or returning customers. The customer support center at RushEssay.com is supposed to be available 24 hours a day, seven days a week via message system and live chat. However, live chat proves to be very unsuccessful for a majority of customers, because it is very difficult to get any sort of reply from the customer service representatives. Even through the message system, it is very difficult to receive any useful information regarding the ordering process, updates on the product, or any other questions, comments, and concerns. Many customers remarked that writers had contacted them asking for extensions on the deadline as they would not have been able to reach them. Even after giving an extension, the final product does not meet the requirements or guidelines written in the order form. Even papers that are finished by the deadline do not cover the necessary topic and are missing important items required in the instructions. Furthermore, the papers are rife with grammatical, spelling, punctuation, and syntax errors that cannot be ignored. While free revisions can be requested, it is the hope of most customers that the writers are professional enough to check their work in order to ensure it does not contain such errors. Customers are only able to pay for essays via PayPal. They are able to request free revisions on their final paper within 14 days after receiving the final paper. RushEssay.com guarantees that the minimum number of words per page is 275 to 300. 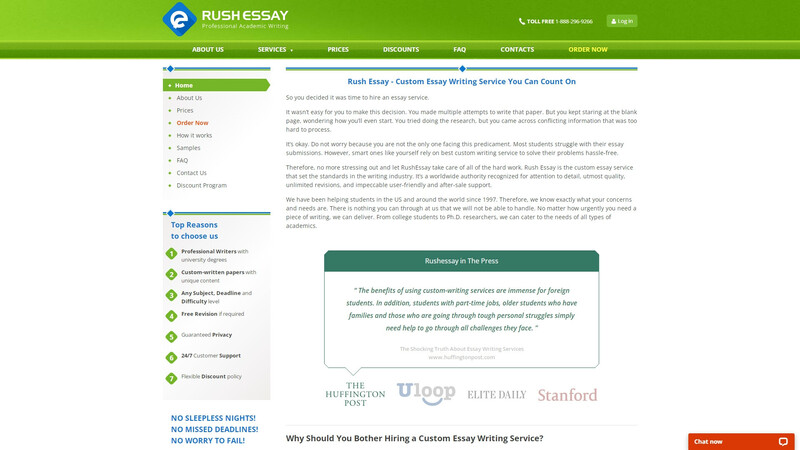 While RushEssay.com guarantees that all customers will receive a high quality final paper, this is in fact a guarantee the online writing company is unable to live up to. The customer support staff is unprofessional and impolite, and the papers are delivered late and contain lots of mistakes. It’s always a nice experience to order again and again but I won't do it. The writing quality was outrageously low. My agent was helpful and polite. My essay was not graded yet. I hope it will be fine. I will never use this company's help again. This is ridiculous. I revised my paper twice and it still had mistakes. My Professors gave me a 65/100. It was a real failure. There was some misunderstanding about the due date. I am glad it was figured out right on time. Seriously, what do they think they take money for? This is a total gross! Everything as I expected. The customer service was polite. I don't know what I received, but it definitely wasn't my paper, it wasn't even a history topic what needed. I am not a fan of writing feedbacks but my bad experience with you made me do it. Total ignorance since the first day I contacted you. Thank you for your work. But I got only C. My Professor could never be pleased. She is such a perfectionist. She found 10 mistakes in my case study. It wasn't a good result. The writer did not follow the instructions. My grade was low and I needed revision and corrections. But even after these changes, I got only 70/100. I expected to receive the confirmation about my order but I got nothing instead. That fact made me worried about the legitimacy of your company. Changes should be made! Had my narrative essay done here, the paper was written well, but it took more time than I expected, they were late for couple hours.